There are also neat things such as variable resistors (called potentiometers) that can change resistance at your will. Quite often you can change the resistance by simply turning a dial. A great way for experimenters to tweak, no? Most robot sensors are actually resistors that change resistance based on some environmental effect. Photoresistors are perfect examples. A change in resistance changes the current crossing the sensor. A change in current causes a change in voltage - voltage is what computers measure to detect the environment. So how can you use resistors for you robot? Well LED's require resistors in series or they burn out. Voltage Amplifiers will need them. Almost every circuit you build will require them for some particular reason. Even if you do not put a resistor in the circuit, theoretically your circuit will still have resistance as all wires carry resistance. Transistors are probably the post important electrical component created. After all computers tend to have billions of them. But not just computers, almost everything today that is remotely electrical probably has them. Your car, your washing machine, your microwave. The list goes on. But transistors are somewhat complicated in theory, and especially calculation. Plus it is my firm opinion that they are outdated technology. So for robotics what you should use is something similar to a transistor called a MOSFET, or Metal Oxide Semiconducting Field-Effect Transistor. The operational theory required to use a MOSFET is not much different from a simple mechanical on/off switch. But instead of flipping a switch, you apply a binary signal to it straight from your microcontroller. Apply a 0 (for zero volts) to the Gate (or Base) and it is turned off, apply a 1 (for usually 5V or more) and it is turned on. It is somewhat like a water spicket. By turning a small valve, you can control huge flows of water through a pipe. If a transistor is turned on, current will flow from the Collector to the Emitter. 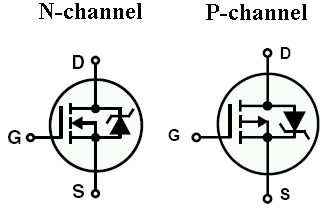 If the N-channel MOSFET is turned on, current will flow from the Drain to the Source. Yes, the names are counter intuitive. What makes transistors more complex is that Collector to Emitter current is not just dependent on Base voltage but also on Base current. All quite complicated . . . then you got Darlington Pairs which are just crazy and stuff . . . MOSFET's are just simple on and off. There is however MOSFETS designed for various applications. But usually a PWM optimized MOSFET would be what you want. Another note on MOSFETS, they are more efficient with higher Gate voltages. So you probably do not want to just apply a simple binary 5V. Instead you should amplify it with say an operational amplifier or even better, a MOSFET Driver IC. All are quite cheap and easy to implement. I highly recommend amplifying the Gate voltage because it would save on battery power, and significantly reduce overheating. Which reminds me of another point . . .
DONT FORGET TO PUT A HEAT SINK ON ALL POWER MOSFETS!!!!!!! They heat up pretty quick and burn you when you touch them. A typical MOSFET is rated for about 300F, but its quite easy for them to reach that temperature. So what can you use a MOSFET for? Well it is required for an H-Bridge. Also, the concept works for DC Motor Braking. Voltage Regulator IC's have various uses, but are usually used for feeding 5V to anything which uses digital logic. Voltage regulators can be easily bought as an IC (check ads on right side of this page), so you do not need to make one on your own . . . unless of course you have crazy power or voltage requirements - such as for robots with ray guns for eyes. There are some general guidelines to follow when using voltage regulators. Voltage regulators will bring any voltage to the set voltage, assuming enough current is available. A 20V battery can also be regulated down to 5V too. However to drop a voltage, current must be expended as heat. Inneffecient! Always try to have the smallest voltage change possible when using regulators. If you need a regulated 5V, use a 6V NiMH pack for example.